The Indian Head or Buffalo Nickel (on Mound) was produced in 1913. This coin was designed by James E. Fraser and is the first type in the series. 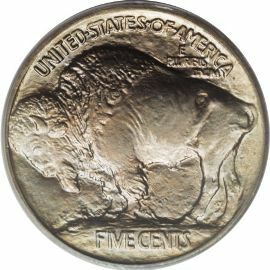 The second type, also coined in 1913, has the buffalo standing on flat ground. Fraser sketched the bison after "Black Diamond" in the New York Zoological Gardens. This coin was so well liked that the design was also used on two subsequent issues at the US Mint. The 2001 American Buffalo Commemorative and the American Buffalo Gold Bullion coins, beginning in 2006, are both modeled after this series. 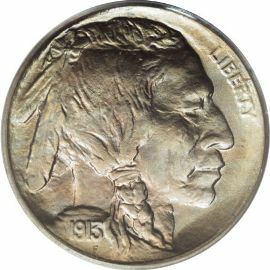 The obverse of this Indian head nickel is a composite of three Indian chiefs who had posed for Fraser years earlier, before the nickel was even thought of. The inscription "LIBERTY" is at approximately the 2 o'clock position on the obverse, and the date is on the shoulder of the Indian chief. The reverse shows an American Bison standing on a mound of dirt with the inscriptions "UNITED STATES OF AMERICA" and "E PLURIBUS UNUM" above the picture. It also has the denomination "FIVE CENTS" below the design.